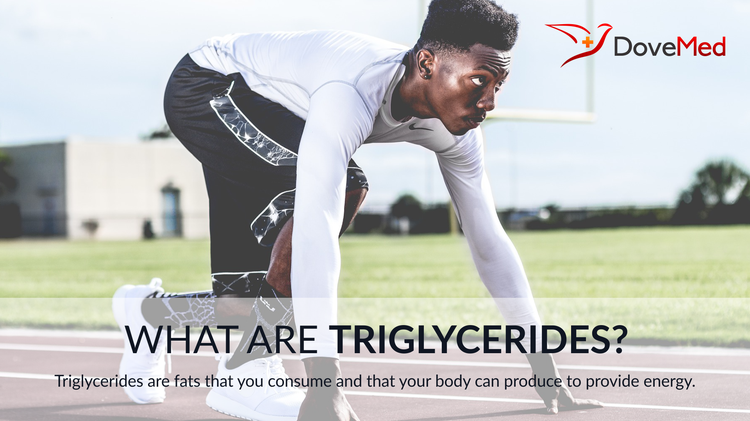 Triglycerides are fats that you consume and that your body can produce to provide energy. Triglycerides are fats that you consume and that your body can produce to provide energy. When you eat a meal high in fat, the fat is absorbed mainly in the small intestine. The small intestine packages the fat along with other products to be sent through the lymphatic system and then the blood stream. In the bloodstream, enzymes break down fats, and free fatty acids are taken up by cells to be used as energy or stored for future use. Between meals or during times of starvation, the stored fats can be released and sent back into the blood stream to feed your cells. It is important to monitor triglyceride levels along with your cholesterol and blood pressure because high levels of triglycerides can lead to atherosclerosis. Atherosclerosis is the thickening of artery walls, which causes blockages, leading to heart attacks and strokes. High triglyceride levels can be caused by liver damage, hypothyroidism, uncontrolled diabetes, kidney problems, and a poor diet. Other factors associated with high levels of triglycerides include obesity and genetic predisposition. Additionally, low levels can be associated with hyperthyroidism, malnutrition, digestion problems, and low-fat diets. Therefore, high or low levels of triglycerides can be signs of other health conditions. Blood tests can be used to monitor triglyceride levels, and require fasting for 12-14 hours prior to testing. The normal level for adults is 150mg/dL, borderline high levels are between 150-199mg/dL, high is between 200-499mg/dL, and very high levels are above 500mg/dL. Lose weight: Losing just 5-10 pounds can lower your triglyceride levels and improve your overall health. Exercise: Exercise will not only help with weight loss, but it can help lower HDL cholesterol, known as bad cholesterol, and increase LDL cholesterol, known as good cholesterol. It can also help your muscles use more fat and remove it from your bloodstream. Reduce caloric intake: Triglycerides can be made from excess calories that are consumed and then stored as fat. Reducing your caloric intake can cut back on this process. Eat healthier fats: Trans fats are very unhealthy because they can lower good cholesterol and raise bad cholesterol levels. Additionally, they increase your risk of developing heart disease and diabetes. Healthy fats include mono and polyunsaturated fatty acids in olive oil and canola oil, omega-3 fatty acids, and nuts. Consume less alcohol: Drinking alcohol can cause your liver to produce excess triglycerides. Therefore, excess alcohol consumption should be avoided. A combination of different lifestyle changes can help you to reduce your triglyceride levels and prevent related diseases. If you are concerned about your triglyceride levels, it is advised to consult your physician. Couillard, C., Després, J. P., Lamarche, B., Bergeron, J., Gagnon, J., Leon, A. S., ... & Bouchard, C. (2001). Effects of endurance exercise training on plasma HDL cholesterol levels depend on levels of triglycerides evidence from men of the Health, Risk Factors, Exercise Training and Genetics (HERITAGE) Family Study. Arteriosclerosis, thrombosis, and vascular biology, 21(7), 1226-1232. Kersten, S., Desvergne, B., & Wahli, W. (2000). Roles of PPARs in health and disease. Nature, 405(6785), 421-424. Aim-High Investigators. (2011). The role of niacin in raising high-density lipoprotein cholesterol to reduce cardiovascular events in patients with atherosclerotic cardiovascular disease and optimally treated low-density lipoprotein cholesterol: rationale and study design. The Atherothrombosis Intervention in Metabolic syndrome with low HDL/high triglycerides: Impact on Global Health outcomes (AIM-HIGH). American heart journal, 161(3), 471-477. Sarwar, N., Danesh, J., Eiriksdottir, G., Sigurdsson, G., Wareham, N., Bingham, S., ... & Gudnason, V. (2007). Triglycerides and the risk of coronary heart disease 10 158 incident cases among 262 525 participants in 29 western prospective studies. Circulation, 115(4), 450-458. Ford, E. S., Giles, W. H., & Dietz, W. H. (2002). Prevalence of the metabolic syndrome among US adults: findings from the third National Health and Nutrition Examination Survey. Jama, 287(3), 356-359.